AirPlay is a great way to stream your music through a set of speakers or through a home stereo, and in some cases, stream a video from your iOS device, Mac or PC. Apple currently sells two products that support this feature, the Apple TV & Airport Express. Apple does license the feature so that third-party developers may support products with it and I will briefly mention it, but today we are going to cover the apple products. The AirPort Express is known as a wireless router. It is nice and compact, perfect for apartments, dorms, or just extending part of a room in your home. It works seamlessly with the Airport Extreme and Time Capsule as an extension, but you should have no problems with other routers. Depending on your setup, you would probably not want to use this as your main router in your home. Reason being it has one Ethernet port. You will only be able to put a line in from you ISP and broadcast wirelessly, but if you are running a home network and have devices that you would want to plug in with Ethernet, tough luck. However, the express is equipped with 5.0 GHz wireless N that is capable up to 300 Mbps, although this will not work with your iPhone or iPad, if you only have wireless N devices in your home, it is an ideal solution. The last limitation to this is it only allows up to 10 devices to be connected to it. The AirPort express features a USB port that is not capable of sharing a USB drive rather a USB printer. If you have a Mac, adding the printer is a breeze. For Windows users, you will have to install the Bonjour software off the Apple website, or with the included CD (download the Latest off apple’s website). But, once Bonjour is installed, it’s a piece of cake. How does this fit with AirPlay? The AirPort express uses a 3.5 mm aux jack to output audio into a receiver, or just a simple speaker. Once your device is plugged in, connected to your network, and setup properly, you are ready to begin streaming your music to your device. 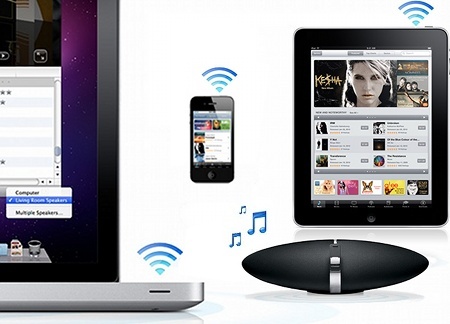 With the Apple AirPort Express, you can even turn your home into a wireless audio system. See our article on how AirPlay an AirPort Express to beat Sonos. The Apple TV is a set top that must be set up with a TV. It features and aux port through the red and white analog ports, although if you are planning on using this system, you will probably want to use the HDMI out port. Another feature is the ability to beam a streaming video in some applications on your iOS device, directly to the Apple TV, and watch them on the big screen. For more details on the Apple TV, check out our full article about it covering it’s high’s and low’s. Apple does a great job with integrating their products together. From the App Store, download the Apple Remote app and you will be able to control your iTunes Library to blast the music to your speakers. Briefly, Apple currently only allows AirPlay audio streaming to companies to use for their products, such as DENON. Certain network receivers from Denon can be upgraded for $50 over the Ethernet port, to allow AirPlay to be enabled. This will allow you to stream directly to your receiver, without the need for any other products. After the integration of the AirPlay API in the iOS SDK, developers from Pandora and Rdio are able to let users use their app and play music directly to Airport devices around the house. Bowers & Wilkins and JBL are also creating products that are built for AirPlay. Soon for a pretty penny, you can purchase devices that will already have the built in functionality of receiving music. If you are interested to stream with AirPlay, the AirPort Express is your best deal. For it’s price and functionality, it works more than a simple AirPlay streaming device, and is a worthy companion to any home network.